Video games are one of the most convenient and budget-friendly gift options around. Most titles and consoles are easy to get unless they're a new release, and even then it's rare that you won't find what you're looking for on the shelf of a nearby gaming store. Plus, they're budget-friendly and very easy to wrap, considering all the bargains on older titles and pre-owned games. With all the great racing titles and simulators out there, it shouldn't be too difficult finding one that a gearhead gamer will like. 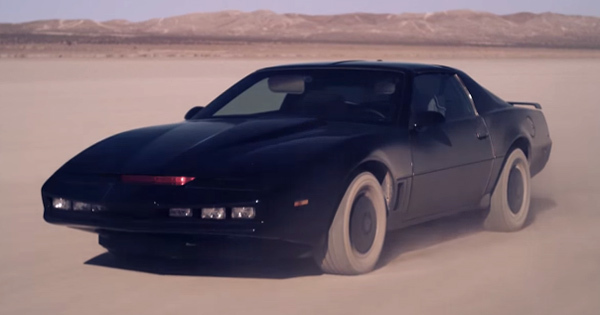 But what if you want to take your gift-giving to a whole new level this holiday season? 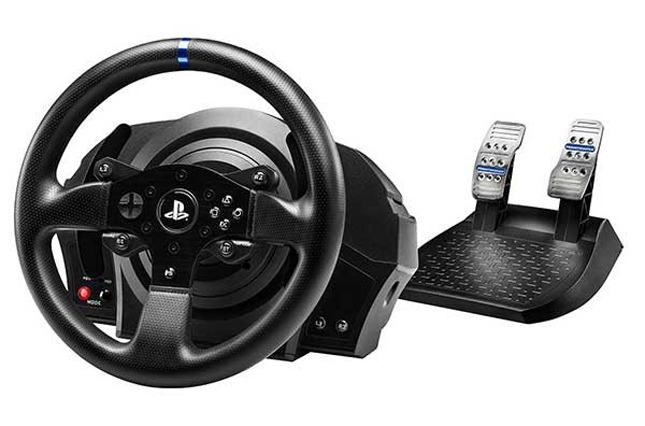 We've come up with a short list of Thrustmaster PS4 racing wheels and accessories to go along with whatever racing title you're planning to get. Thrustmaster VG T300RS force-feedback racing wheel (P19,500). If you're not on a budget, then this is the way to go. The VG T300RS is both PS3- and PS4-compatible, and features a high-end industrial-class brushless motor, as well as a fully detachable 11-inch GT-style racing wheel with brushed-metal central spokes. The pedals are fully adjustable with six different height and spacing options, while the brake pedal features progressive resistance. 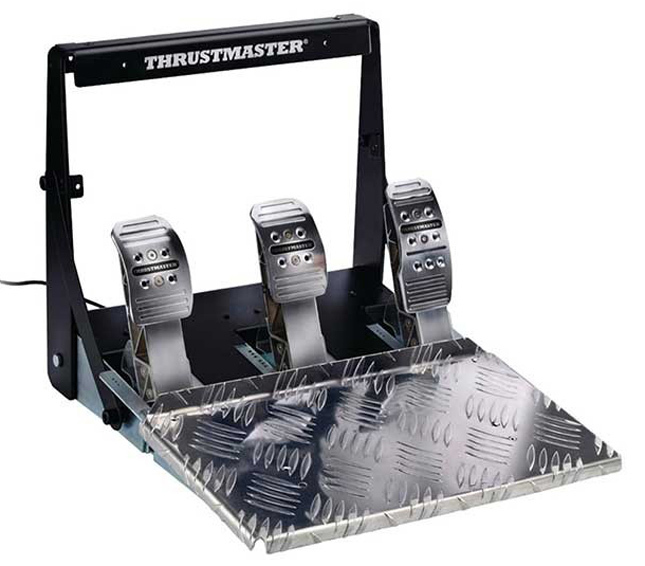 Thrustmaster VG T3PA-Pro three-pedal set (P8,595). Looking to go further than the VG T300RS? This three-pedal add-on features more customization and adjustment options and stability. The VG T3PA-Pro can be adjusted into two different positions: F1-style (floor-mounted) and GT-style (suspended position). It's made from 100% metal and weighs 15 pounds, meaning this baby isn't going to move an inch when you slam on the brakes. The set includes two different brake mods that can be positioned to adjust pressure force. 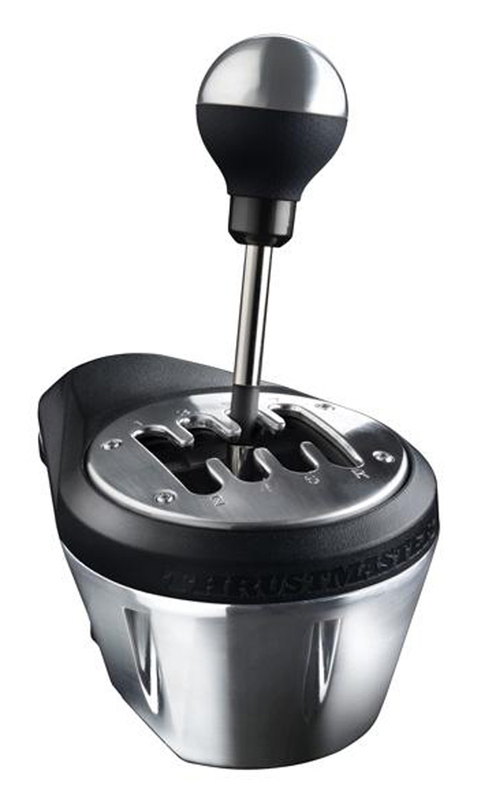 Thrustmaster TH8A gearbox shifter (P8,595). No buttons or paddles will ever be able to replicate the sensation of switching gears via a traditional stick--even when it comes to video games. The 5.12-inch-tall shifter has a detachable knob and a clamping system that runs on Halleffect Accurate Technology, which means precision won't deteriorate over time. The gearbox also allows for two different driving styles: H-patterned or sequential shifting. 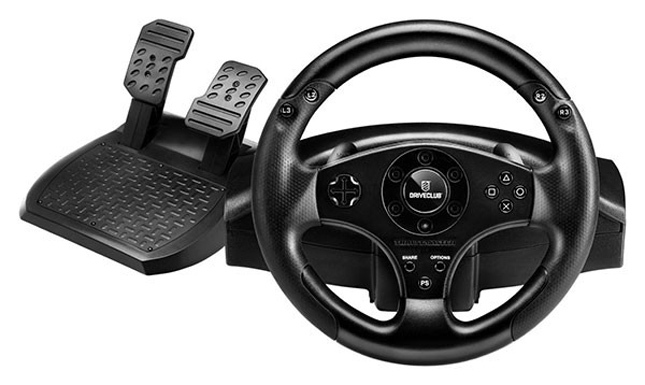 Thrustmaster T80 racing wheel (P5,500). If you're looking for a more budget-friendly option, the T80 racing wheel is worth looking into. The T80 is 12 inches in diameter, and is wrapped in rubber-textured cladding for superior grip. The wheel also features 11 action buttons, a D-pad, wheel-mounted sequential paddle shifters, and a large pedal set with adjustment capability.